When I woke up this morning to get ready for the Awesome 80s 10k I didn’t realize that within the hour I was going to be looking at my 10 year-old self in the mirror. Side pony. High and tight. We made our way to the start and could heard the old school jams on super blast. First thing that pops into my mind? Dance party USA. You know I can’t hold back the robot in me. If there is one dance I can rock it’s the freaking robot. Dancing is the perfect warm up, no? If nothing else I was hoping it would help calm my sister’s race jitters. The gun was due to go off at 7 and we still had not seen the fam. We then got a call that they were stuck in traffic and that they would catch up later. 7:05…7:10…7:15…and we were finally off. Better late than never. The 5k and 10k all went started together. We were told there would be some signage but to remember the 10k looped twice around the island. Okey dokey. Loop 1 no sweat, loop 2? CLUSTER. Think front of the 10k pack merging with 5k walkers 10 deep. No cones, no course marshalls, no organization and zero courtesy. At mile 4 a group decided to stop directly in front of me to take a photo. They were 7-8 deep and I had nowhere to go. Left blocked, right blocked. What happened? A crash. At least I didn’t go down. I understand that themed runs are fun and a lot of people take pics. At least have etiquette and move to the right and out of the path of runners. Sigh. Finished loop 2 and had to assume to turn right toward the 5k route finish because there was no sign and no volunteers directing anyone. As I approached the finish there was finally someone yelling for the 10k runners to go right. Got it. Turned off to the right ran down an unmarked path and then randomly up the side of an embankment that looked to be roped off for construction. No sign, just an arrow so we all assumed climb the dirt. This took us to a paved path and it was an assumption to just stay on that path back towards the finish. I crossed the finish in 45:17. I later learned I was 2nd in AG (clearly not a super fast field), 3rd female based on gun, 5th based on chip. Not too shabby just a few weeks after Chicago. I then ran a cool down and waited for my sis to finish. She crossed in 1:03! So proud of her! We caught up with my SIL and friend Lindsey and listened to a sweet cover band while we waited for my parents to finish. When we saw them coming we lined up at the finish and cheered our hearts out. My parents had walked the 10k and due to the crazy mentioned above (lack of signs, etc) ended up lost and walking way more than a 10k. Are they cute or what? It was really fun getting all dressed up and spending time together getting our run on. Love love love my family. We recovered tonight with tons of good food and another GIANTS win!! Excellent way to end the day if I do say so myself. I would like to thank each of you for your kind words on my Chicago Marathon recap. I know that every race will not be like that one but I am going to savor in its awesomeness for a little while. If nothing else I hope that it encourages us all to dig deep and have faith in ourselves. We can do so much more than we think we can. I’m about to share a picture with you that will either make you laugh your arse off or scare you away forever. This is me, my little brother and my little sister in 1987. When my sister first told me about it I was kind of “meh” on it. Mostly because I hate Fiesta Island. Not kidding. I had a bad experience at the end of RNR SD 2010 and pretty much swore off running there ever again. And then she reminded me it’s her first 10k. So I’m all signed up on team Punky Brew-ster and have my hot pink ready to go. No ugly sweaters in this crew but I’m sure we’ll see plenty on the course. More importantly I can’t wait to see my little cross that finish line. Have you run a 10k? Any advice for my little sis? Spending time with girlfriends is really important to me. Getting to eat, drink and laugh without a care in the world is so much fun. FACT: there are just some things you can’t discuss with dudes. Thank you all for a fabulous night (even though I was a leeeeetle late)! For some people running a marathon comes easy. I am not one of those people. My head often hinders my ability when it comes to 26.2. I haven’t decided if I am crazy or I just like to torture myself. Total.head.case. It’s gross. When I got to Chicago I felt excited and nervous to toe the line. I had just two 20 mile training runs this cycle but felt confident yet uneasy about running a strong race. I had planned on running with a friend and we decided that there would be no pressure to stay together. We would start easy and push later in the race. I just needed some sort of breakthrough. On Sunday morning the alarm went off at 4:15. I shut it off and planned on going back to sleep and then there was a knock at the door. Breakfast. The hotel I stayed at had an option for a boxed prerace meal and I jumped on it. There was a lot of food in that little box so I took what I wanted and gave the rest to L. I hopped in the shower to wake up and then checked the weather. Cloudy and 38. I figured the sun would come out and some point so I went with shorts, compression socks, a tank and long sleeve. At 6:40 I put on my Garmin and slippped on my little purple “believe” bracelet to support my MIL. I gathered my stuff, put my headphones in my pocket and was ready to go. My friend and I agreed to meet at 7 close to the start so that we could get into our corral before it closed at 7:20. I sent her a text that I was leaving and left my phone behind. I got to our meeting point at 6:55…and waited…and waited…and waited. By 7:05 I was worried and knew that the corrals were closing soon. I did one last final sweep of the area and decided it was time to go. I was going to be running solo. L went with me until spectators were no longer allowed and I literally had to run to get to the start. I think I was one of the last people to make it into corral C.
I stood at the back of the pack just checking everything out. There were so many runners and so many people. It was awesome. The start gun went off and it took about 5 or so minutes for me to cross the start. My plan was to go out easy and see how I felt. I passed the 5k point at 27 min or so and realized I was running at training pace. Time to speed up a little. I am not sure how to describe it other than my mind was ready to move but my legs were not. My legs were freezing and they felt heavy. Like I had ice blocks strapped on. NO! You all know what happened right? For the next several miles all I could think about was how effing cold and heavy my legs felt. Told you I think I like to torture myself. At mile 5 I took my first gel and crossed the 10k mark in 54 min. I think at this point I knew my legs had no intention of going faster so it was time to have some serious fun. And I DID! I high-fived every kid I saw. I ate oranges, I thanked neighbors for cheering us on and I happily took an ice cold water bottle from someone to refill my handheld. I looked at the buildings, I laughed, I thought alot…about our move, my MIL, my crazy job, my kids. I think I said “I can’t believe I am running the Chicago Marathon. This is awesome!” at least 5 times out loud. I crossed the half way point in just under 1:54 and decided I was done checking my Garmin (which was ahead by .30. Bad tangents I guess) and was going to run to finish strong. The miles just kept ticking by. At mile 18 a lady on the side of the road was holding a sign that said “Only 8.2 miles left. After 18 that ain’t nothin.” That made me smile. Only 8.2 miles left. I could do that! I looked down at that little purple bracelet and just kept running. As I approached mile 20 I was ready for it. The wall. I have hit it in every single marathon. I took my 4th gel and reminded myself that I had an iPod zipped in my pocket so if I felt like I needed it I could bust it out. And then suddenly…. Mile 21. What? Wait? Where is the wall? It’s gotta be here somewhere. Holy crap I am passing people. A lot of them. I am usually the one being passed. Mile 22. I looked at that little purple bracelet. There is no pain while running that is worse than what my MIL is going through. Mile 23. I should be speeding up but at this point my pace is working. Why ruin a good thing? I’ve freaking got this. Mile 24. I grab gatorade chews from a volunteer. I will need them to help me pass the time to get me through the last 2.2 miles. A lot of people are walking, I pick up the pace a bit. Mile 24.5. I meet Kevin. He is from NY. He was hungover, barely slept and had run a marathon the weekend before. This race was his victory lap. Without saying it we decide we’re going to finish together. Mile 25. I look at my watch. 3:38. I knew I was going to PR. I said it right then. Out loud. And then I cried a little. I finally freaking enjoyed a marathon. Yeah the beginning sucked but when I let go I loved it. And then I decided it was time to run fast. It’s never too late to run fast. Mile 26: I saw 7:38 pace on my watch. I had a lot of kick left. I felt like I could run forever. The crowds were awesome. Me and my new friend looked at each other and sprinted. And giggled like little kids. I crossed the finish line in 3:49:11. I took my medal, thanked my buddy for running with me and looked back down at that bracelet. WE did it. I think I did the robot, the running man and the cabbage patch all within a 30 second span. Impressive, no? So I didn’t break any records, I didn’t make it hurt, and I certainly didn’t lay the hammer down so that I couldn’t breathe at the end. But you know what? I didn’t care. I freaking ran the best marathon that I have ever ran. I was never tired and I had the most fun I have ever had running a race. Man I needed that! When I finally saw my splits I realized that I was within 1 min of running a completely even race. That is what letting go does. It allows me to just run. I got a text later that evening from my “coach” (who has done so much for my running and I can’t thank him enough) telling me he was proud of me. Sometimes that’s all that any of us need to hear. I am proud of me too. Although there will be another race one thing is certain: I will never forget Chicago. I will never forget the feeling of finally “getting” the marathon. It was the breakthrough I was looking for. I am a heck of a lot more confident in myself. No longer a prisoner in mental self-doubt jail , the headcase is out and this girl is in. Although the marathon will never be easy for me, one day, just maybe, I will do something big. Here we go! Lucky #7! 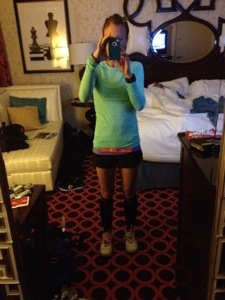 It’s time to head to dinner with Pam and mentally get ready to run. Race weather currently looks like bright sunshine and 39 degrees at the start. As long as the wind doesn’t pick up it should be perfect for all 26.2. Too bad we couldn’t move seats around and all sit together. We would have chatted for all 3 1/2 hours of the flight, I’m sure of it! I bet our hubby’s would have loved that. Yes this is a bad pic but, no, you are not seeing things. 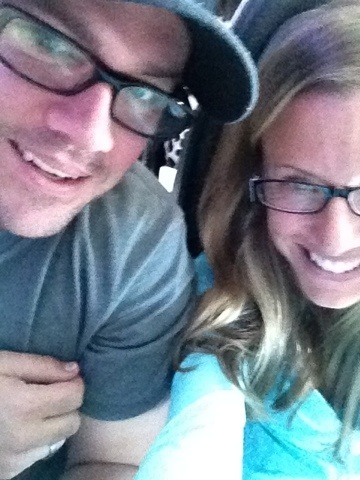 We are glasses twinsies. This is what happens after 10 years together. True love people. Although I didn’t think I would, I did get some rest on the flight. I fell asleep for a whole 5 minutes. Right when I was about to go into an awesome dream I dropped my water bottle. ARGH! It was just like that feeling when I first fall asleep and suddenly I am free-falling and kick my sheets like the karate kid. Boo. Nap over. I then realized we had free in-flight TV and proceeded to watch Flip This (or a title close to that) on Bravo for the rest of the flight. Before I knew it we were landing. The Chicago airport is so easy to navigate. The 6 of us got our bags and were on our way within 30 minutes. That’s a zillion times faster than SoCal. Yet another quality photo. Wow. Sorry guys. Once we got settled we headed to dinner at the Emerald Loop. It’s a cool Irish Bar & Grill that was a jewelry building back in the 1920s where diamonds were delivered for safe keeping. Rad history. I think I also read that it was in the movie Batman Begins. I loved that movie…or maybe I just loved Christian Bale. Woah, getting off track. Back to dinner. The food was pretty darn good and L was happy because he got to watch baseball. The rest of the night is going to be chill since tomorrow will be full of all things running. Hope you all are ready for a VLOG because it’s coming people. You will be expoing with me. FUNNNNN. P/S I saw Lisa Kudrow this morning at the airport and it reminded me of how much I loved Friends back in the day. She is and always will be Phoebe. It’s finally here. Race weekend. Let the VLOGing, running and madness begin. Chicago I’m on my way!